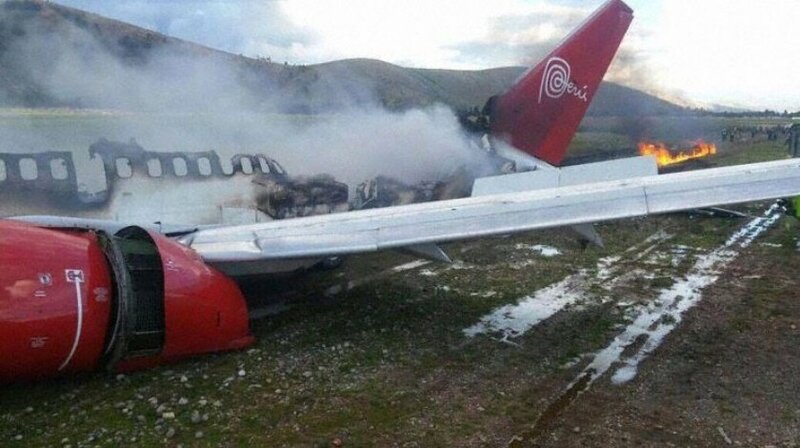 A Peruvian Airlines Boeing 737-300 performing flight from Lima to Jauja (Peru) with 141 people on board, landed on Jauja’s runway 31, but veered off the runway, suffered the collapse of all gear and burst into flames coming to a stop after skidding on fire for some distance. The aircraft was evacuated. There were no injuries, the aircraft received substantial damage beyond repair. Passengers reported there were two strong impacts upon arrival. Local media report 39 occupants were taken to hospitals with injuries. Peru’s Ministry of Transport and Communication reported the aircraft OB-2036-P had had a hard landing at Jauja Airport. All passengers and crew were evacuated and are well. A fire has been extinguished in the meantime. The Accident Investigation Commission is going to investigate the accident. The local public prosecutor reported there were no injuries and no casualties.